Because bathrooms have a lot of water and humidity it is common for mold (also spelled “mould”) to grow in them. Adequate waterproofing and ventilation will ensure your newly renovated bathroom remains mold free. Alert Restoration will discuss waterproofing options with you (eg. Schluter shower membranes) as well as appropriate ventilation. One of the best ways to reduce the cost of a bathroom renovation is to resist the urge to move plumbing. Moving water supply or drainage significantly increases the cost of any bathroom remodeling project. Working with your current layout is a great way to stay within your bathroom renovation budget. When it comes to showers and tubs, there are many options that will give your bathroom a stylish look without “breaking the bank”. Some prefabricated shower bases and units are stylish and they are less expensive than tiled showers. If your heart is set on tile consider using high end tile as an accent alongside a less expensive tile. When choosing a tub, soaker tubs are an upgrade to standard tubs and they are less expensive than a Jacuzzi or stand alone tub. If you need a new toilet, a low flush toilet will save water, reducing your costs over the long run. You can spruce up your bathroom without a huge expense by installing new fixtures and a new vanity/sink. Rather than going with custom designs, you’ll save money by purchasing these items at your local home improvement store. Many products can be purchased right off the shelf that will give your bathroom a stylish look at a reasonable price. With respect to natural stone counter tops, price differences are based on colour, grade, and which slabs the manufacturer has in stock. If you are flexible with your choice you’ll be able to save money in this area. Alternatively, a cultured marble counter top could be installed. These are available in standard sizes and are reasonably priced. When it’s time to select bathroom flooring, you don’t have to choose expensive tiles to get a fashionable look. Vinyl plank flooring and luxury vinyl flooring give bathrooms an upscale look at an affordable price. Depending on your home and bathroom, sheet or square vinyl may work just fine. There are some reasonably priced tiles as well. The least expensive way to give your bathroom a lift in the lighting area is to update the light fixtures. As with plumbing, changing the location of the lights or adding new lights can get expensive as the expertise of a licensed electrician is required. As a last point of discussion, painting is an inexpensive remodeling technique that can brighten your bathroom finishing the look you desire. As your bathroom contractor, Alert Restoration will co-ordinate a team of skilled tradesmen, plumbers and electricians to ensure your bathroom renovation progresses smoothly. Working respectfully in your home, Alert Restoration will ensure the job site is left neat and tidy at the end of each work day. Most importantly, you can count on Alert Restoration to deliver a bathroom renovation with superior quality workmanship! 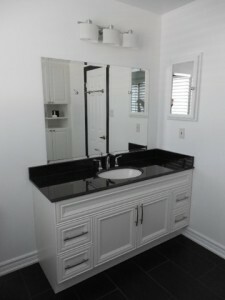 If you want to renovate your bathroom and you are on a budget, contact Alert Restoration. We provide affordable bathroom renovations to customers in Oakville, Mississauga and the surrounding areas. Let us help you turn your bathroom renovation dreams into reality!